Two Iranian vessels have arrived in the Gulf of Aden, off the coast of Yemen, where Saudi Arabia is on a bombing campaign against anti-government Houthi rebels. The Alborz destroyer and Bushehr logistics vessel are on a patrol mission in the Gulf of Aden, south of Yemen, and the Red Sea, according to Navy Commander Rear Admiral Habibollah Sayyari. He says the ships will "provide [safety for] Iran’s shipping lines and protect the Islamic Republic of Iran’s interests in the high seas," Press TV reports. According to Tehran officials, the warships will be protecting a crucial trade route against pirates. 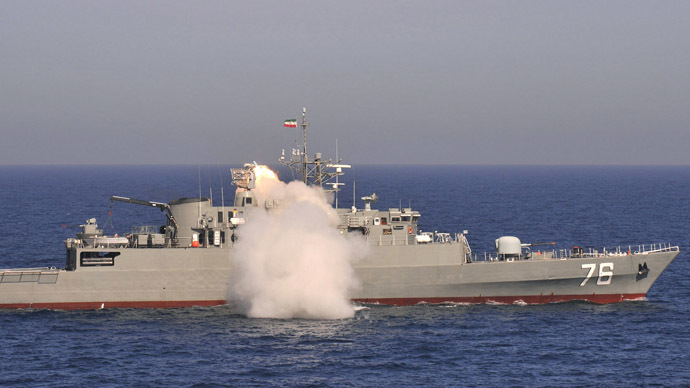 The Iranian Navy has been conducting such patrols since 2008. Iran's fleet is headed into troubled waters, as at the moment Yemen is blockaded off by a Saudi Arabia-led military coalition. They are on a bombing campaign against anti-government Houthi Shia rebels, whose uprising forced Yemen's President Abd Rabbuh Mansur Hadi to flee the country. He is currently in Saudi Arabia. Iran has been vocal in calling for an end to the airstrikes against Houthis, which often end up hitting civilians. Saudi and Western officials believe Iran is directly supporting the Houthis with money and weapons, aiming to take control of Yemen's Red Sea coast - something Tehran denies. The fierce bombing campaign has led to over 560 deaths in just two weeks, according to the latest World Health Organization estimates. It describes the situation in Yemen as a rapidly-unfolding humanitarian catastrophe, with over 1,700 people wounded and 100,000 displaced. An international evacuation effort is under way, with India alone rescuing some 4,000 of its citizens from the war zone. Russia is also taking part. So far, it has sent five airplanes to Yemen, rescuing its nationals, as well citizens of 11 other countries. With the chaos triggered by the Houthi uprising and the airstrikes, militant and terrorist groups are finding it increasingly easy to operate in Yemen. Last week, Al-Qaeda in the Arabian Peninsula (AQAP) captured the port city of Al Mukalla, seizing an army base and freeing 300 prisoners from a local jail. On Tuesday, Al-Qaeda militants reportedly attacked an outpost on Yemen's border with Saudi Arabia, killing several officers and taking over the checkpoint.